← Seaside Gardening: Fountain grass or Pennisetum alopecurides ‘Hameln’ is a staple of the shoreline garden. I found a wonderful twig frame and decided to plant it full of succulents this year. The trick is keeping them in their so they can take root. First I wove a wire backing on one side of the frame. 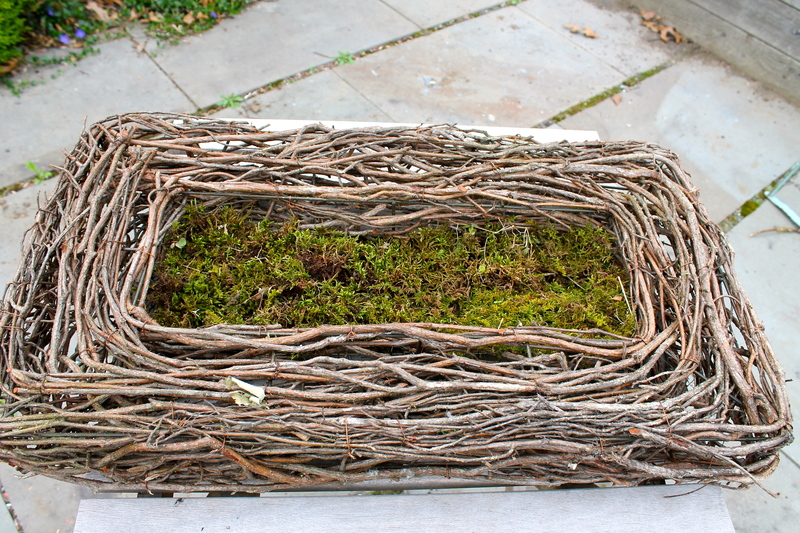 Then stuffed it full of fresh moss from the woods in back of our house. (Which looked so terrific, I was tempted to leave it like that!) 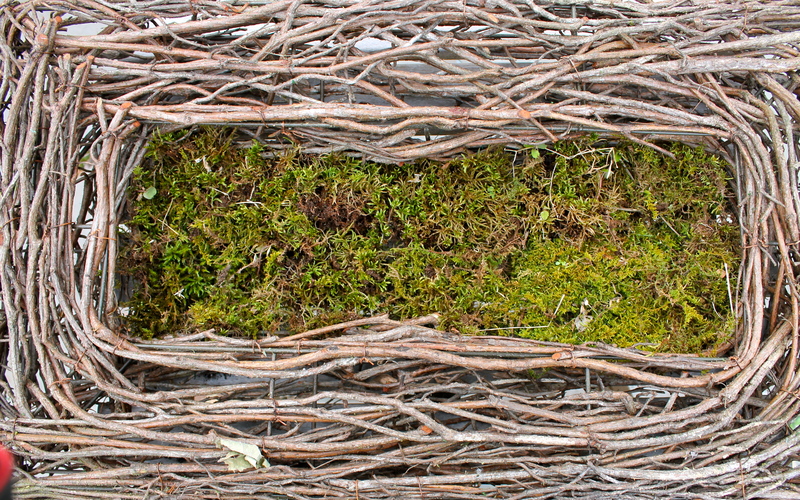 Then I laid in a layer of potting soil, which is held in place by the moss. 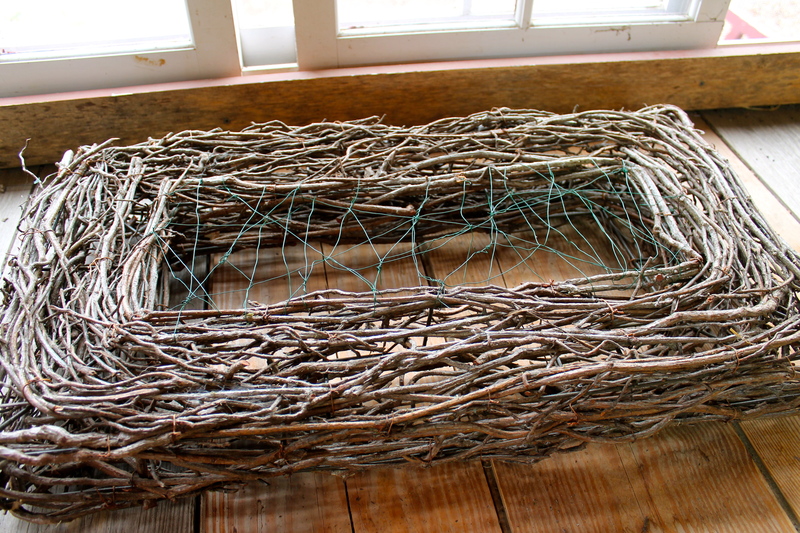 Next time I try this, I might use a layer of window screen rather in the wire, which is what I often use to cover drainage holes in the bottom of pots for container gardens. It is sold by the foot at hardware stores. 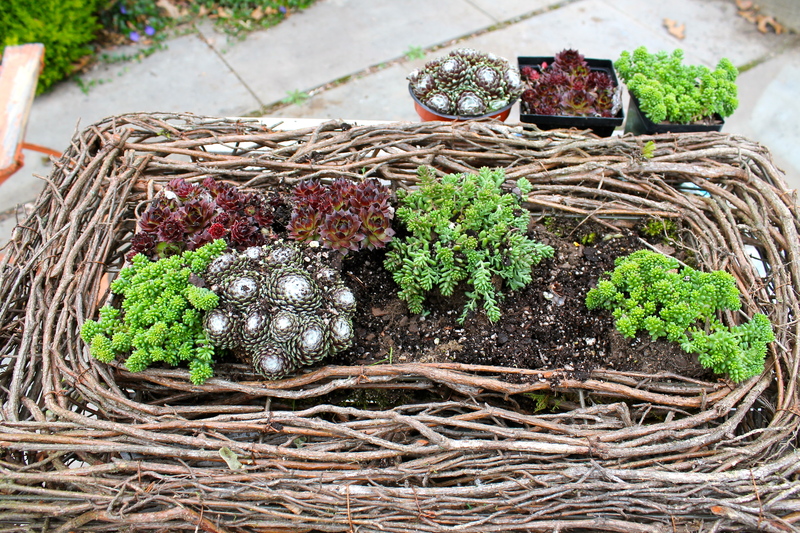 Now for the plants: I am using four kinds of sedum for this one, bought in small containers each under $5.00. 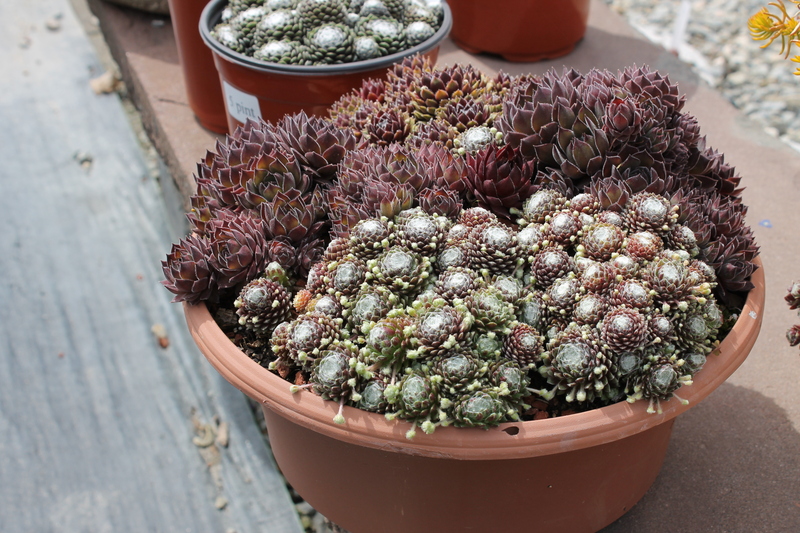 The sedums are: Sedum divergens, (middle,green) Sedum borchii sport, (edges, green) Sempervivum ‘Hidde’, commonly known as ‘Hens and Chicks’ (Red), and another ‘Hens and Chicks’ I had never seen before Sempervivum a. ‘Cobweb’. (White and “fuzzy”.) I composed these in my cart on the spot the nursery, looking at other containers they had on display (see photo below) for inspiration. There is no right or wrong here – just be playful and have fun! Other succulent plants could be used here too besides the sedum – Portulaca is one that comes to mind. Almost done – need half of a plant to tuck in near the top left…and now just let it sit and wait for the plants to take root, about a month. In the meantime, plenty of sun and occasional watering. I used eight containers, so did the whole thing for $40. I will hang this beauty on an outside wall in a month from now, and will follow up with a post. Stay tuned! This entry was posted in Uncategorized and tagged container gardening. 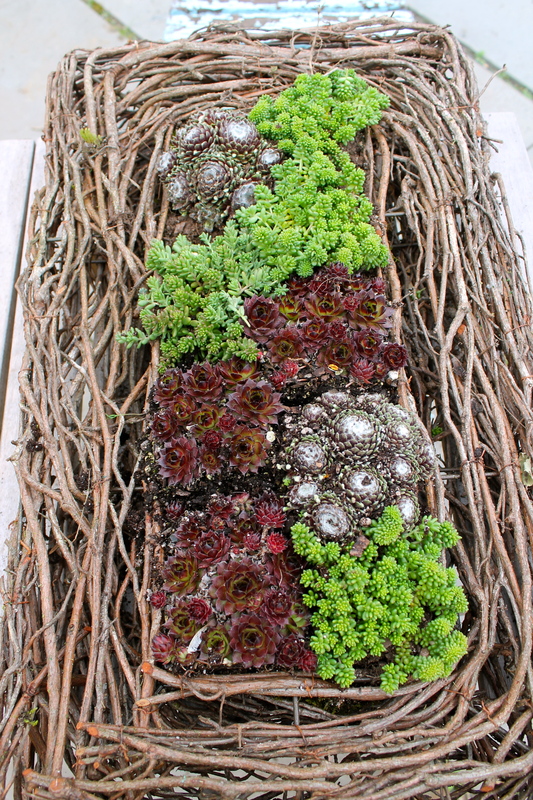 hens and chicks, Sedum frame, succulent containers, succulent plants, twig frames, vertical gardening. Bookmark the permalink.